Do you love cheese but get stumped when trying to pair it with other foods? 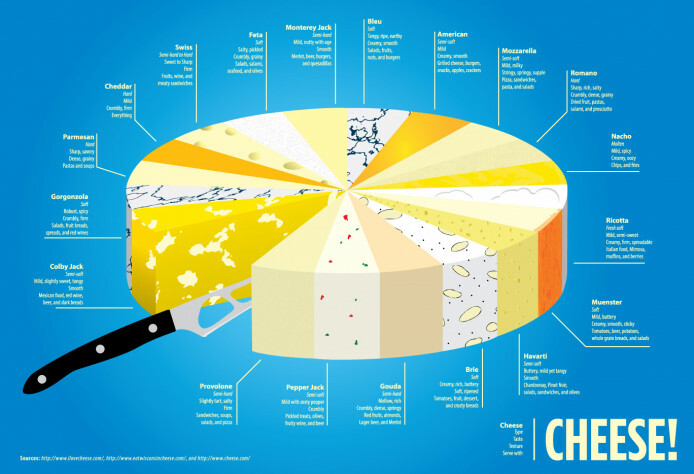 This nifty infographic from Visually categorizes 19 of the world's most popular cheeses by color, texture, flavor and suggests what food and drinks they pair well with. For instance, gorgonzola is a robust crumbly cheese that pairs well with salads, fruit breads, red wine and spreads. Are you crazy about brie? This creamy French cheese was made for pairing with crusty baguettes, fruit and dessert. Go ahead and see if your favorite cheese made the list below. Interested in more? Check out our run down of the 10 smelliest cheeses in the world.